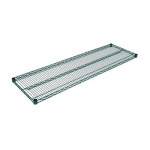 The John Boos EPS-2460-G wire shelf can hold 800 pounds of evenly distributed weight. This unit is great for storing supplies like plastic boxes, to-go cups, and more. Dust accumulation is prevented by its wire design. The John Boos EPS-2460-G wire shelf measures 60 inches long by 24 inches wide. It is coated with green epoxy to resist corrosion and clean easily. The various benefits and features of wire shelving can be found in our wire shelving article.